It is all lightness, transparency, and simplicity. 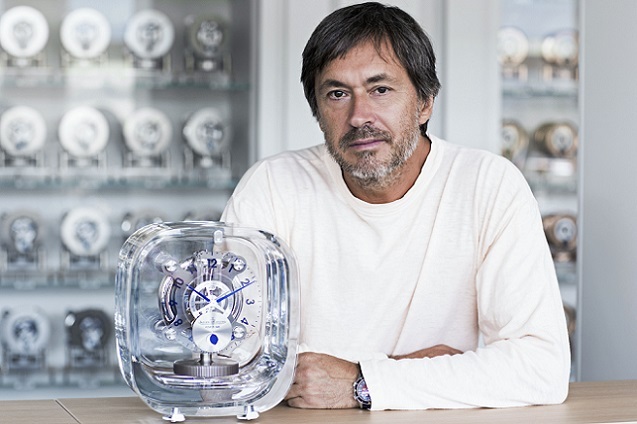 At first glance, what draws the eye in Marc Newson’s Atmos 568 is its timekeeping mechanism, which appears to float freely in the air, while actually being held in place by the rear part of the movement. Its very simple dial is optimised for easy legibility. Although light passes right through the clear glass face, it is simple to read thanks to blue transferred Arabic numerals that always face outwards and are underscored by a minute circle. To avoid adding further elements, the marker indicating the month has been designed to form part of the transparent dial. The counterweights are painstakingly designed to melt from sight, while perfectly balancing the hands picked out in a harmonious echo of Marc Newson’s chosen blue. Uniquely for an Atmos, the entire cycle of moon phases is shown with a white moon and a blue sky on a very smoothly finished disc embellished with concentric striations. On the movement’s reverse, the mechanism is visibly held in place at four points, rather than the three on traditional Atmos clocks, to create symmetry. The membrane bridge, redesigned in a cross-shape and with a brushed finish, showcases the membrane’s bellows to great effect. It bears the clock’s name in the chosen shade of blue, along with the designer’s discreet signature in his trademark orange. Closer inspection reveals a continuous play of light on the movement, which was devised by Manufacture artisans and had some of its components redesigned by Marc Newson. It is worked in a very contemporary-looking matte satin-brushed finish, with a number of shiny areas that are thrown into brilliant relief by the light streaming through the crystal. A brand new design for the balance wheel features grooves with matte tooth surfaces and shiny hollows, so that as it rotates back and forth, it creates a beautiful pattern of remarkable subtlety reflecting the sun’s rays. A true show of craftsmanship! Another mobile part of the movement, the membrane, is adorned with the same play of contrasting finishes, shiny depths set off by a matte exterior.